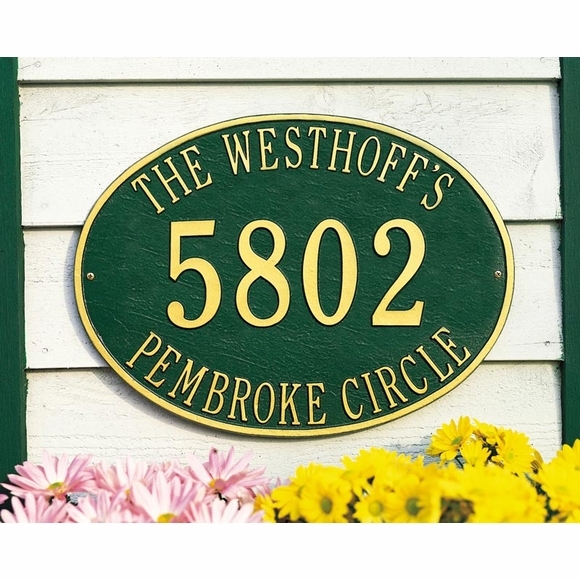 Hawthorne 19x14 Three Line Oval Address Sign - - large estate size personalized plaque proportioned for larger homes and increased visibility across expansive yards. Made in USA. Holds up to seventeen 1.75" characters on line 1. Holds up to five extra-large 4.5" numbers on line 2 in the middle of the plaque. Holds up to seventeen 1.75" characters on line 3. Colors (from left to right in small images): AB antique brass; AC antique copper; BG black with gold characters; BS black with silver characters; BW black with white characters; GG green with gold characters; OB oil rubbed bronze; OG bronze with gold characters; PS pewter with silver characters; red with gold characters; and WG white with gold characters. Three line estate size oval address plaque is also available with one line and two lines of personalization (see Related Products).